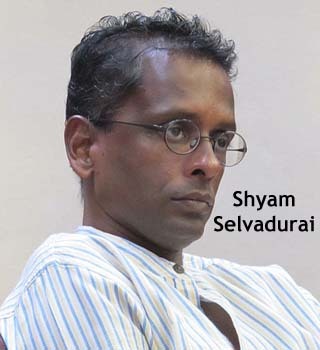 Shyam Selvadurai (born 12 February 1965) is a Sri Lankan Canadian novelist who wrote Funny Boy (1994), which won the Books in Canada First Novel Award, andCinnamon Gardens (1998). He currently lives in Toronto with his partner Andrew Champion. Selvadurai recounted an account of the discomfort he and his partner experienced during a period spent in Sri Lanka in 1997 in his essay “Coming Out” in Time Asia‘s special issue on the Asian diaspora in 2003. In 2004, Selvadurai edited a collection of short stories: Story-Wallah: Short Fiction from South Asian Writers, which includes works by Salman Rushdie, Monica Ali, andHanif Kureishi, among others. He published a young adult novel, Swimming in the Monsoon Sea, in 2005. Swimming won the Lambda Literary Award in the Children’s and Youth Literature category in 2006. He was a contributor to TOK: Writing the New Toronto, Book 1. In 2014, Shyam was presented the Bonham Centre Award from The Mark S. Bonham Centre for Sexual Diversity Studies, University of Toronto, for his contributions to the advancement and education of issues around sexual identification,.